Teach children the basic concepts of counting, days, weeks, years, and holidays using fun, free, printable calendars. Use them in the classroom, at home, or with youth groups to keep track of important dates. Click on the calendar image and download 12 decorative monthly calendars. All 12 months are featured in one document and each has a unique banner loaded with fun graphics related to that month's season and notable holidays. Type the proper dates into each day's square, or leave them blank, then print the coloring pages. If you run into trouble using the printable sheets, consult the Adobe guide for troubleshooting tips. If you plan to use the calendar pages once, print them on standard copy paper. If you plan to use them for multiple activities or with mutliple children in a group setting, consider printing each page on a thicker weight paper like card stock. At their basic level, blank calendar pages can serve as educational coloring pages. Add proper dates and print out all 12 pages. Write in special dates or holidays, and then ask kids to help you color the top banner and add seasonal stickers to those important date squares. Hang the monthly calendars at the appropriate time for kids to view. At the start of each month, print off the corresponding calendar page with one copy for every child. Have kids fill in the correct dates and color the top. Laminate each page and hang one month at a time where kids can reach it. Give children specific calendar jobs like coloring the banner, crossing off days that have passed, or drawing weather images on each day using dry erase markers. Take your lessons one step further by incorporating other skills that aren't directly related to seasons or dates. Create a progressive story by asking kids to write one new word or phrase every day in a square, moving from left to right and top to bottom. Challenge kids to create a story that reads cohesively at the end of the month. Make an annual planner by securing the pages together on one side with staples or placing them in order in a thin binder. 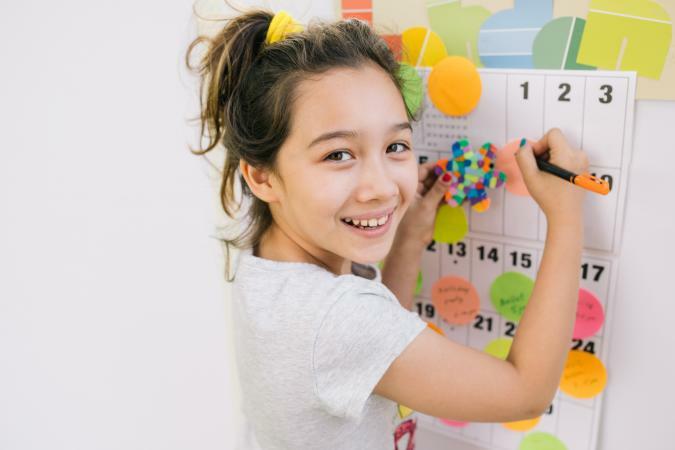 Kids can add dates, color the banner, add homework assignments or sport practices, and cross off days as they pass to keep track of their own lives. Challenge children to create a unique pixel art image for each month by coloring in certain squares with certain colors to make a recognizable image. For example, kids could create a happy face by coloring the second week Tuesday and Thursday squares black, the fourth week Monday through Friday squares black, and all other squares yellow. Create custom works of art or useful, personalized planning tools when you download and print free calendar pages. Kids will love the exciting banner images while learning about concepts such as grids or time.